We are just getting started on our visit to the D-Day landing beaches and battlefields in Normandy. 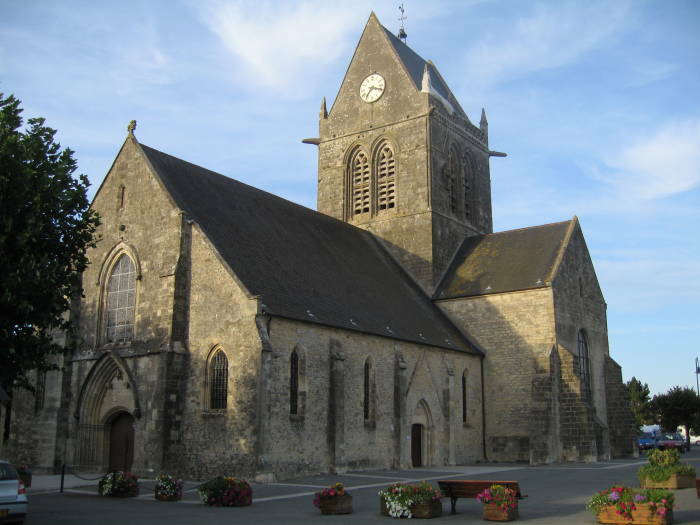 We have figured out how to get there and find our way around, and we are starting in Sainte-Mère-Église. 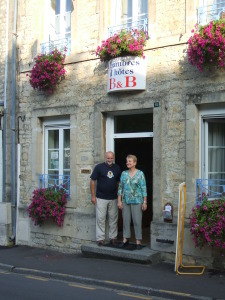 We have found a place to stay there, and the town will be our base for our visit to Normandy. We will start by looking around the town itself and visiting its nice museum. 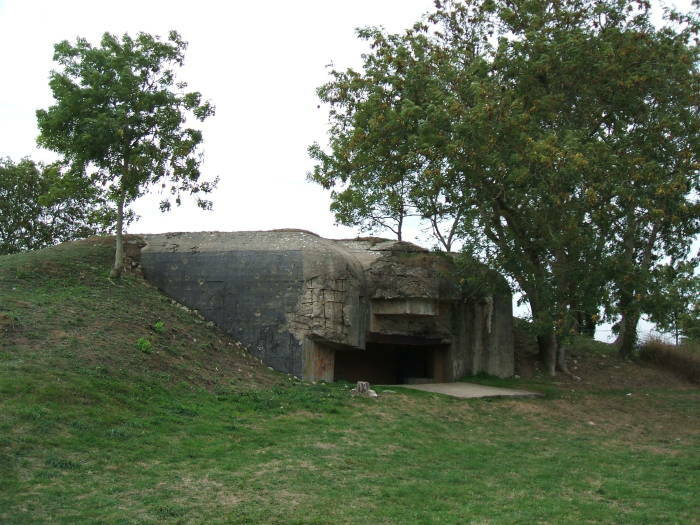 Then we will visit some nearby sites including an airfield at Écausseville and a complex of German bunkers and artillery batteries at Azeville. Sainte-Mère-Église was on a road the Germans would probably use to counterattack the landings on Utah and Omaha Beaches, so units of the U.S. 82nd Airborne and 101st Airborne Divisions parachuted into the town and the surrounding countryside on the night of 5/6 June 1944 to take and occupy the town and other crucial roads and bridges in the area. This airborne assault was known as Mission Boston. 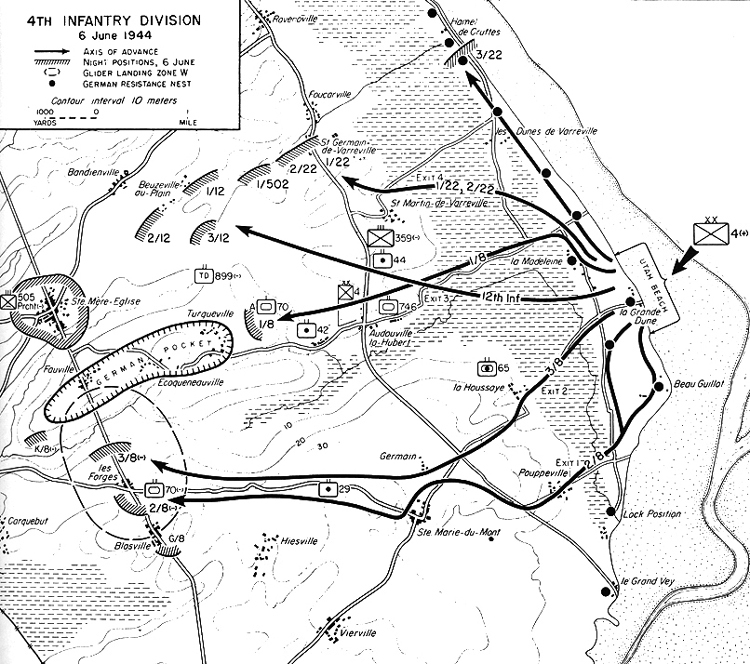 Below is a U.S. military map from "Cross-Channel Attack" showing Sainte-Mère-Église near the left margin, Utah Beach at right, and the movements of units of the 4th Infantry Division. The parachute drops started at about 0140, with about 370 C-47 troop carriers planning to insert the troops into an area of about 10 square miles. Gliders would follow, carrying heavier equipment and small vehicles. Another page of mine details a visit to a base near Oxford in the UK where some of the glider missions departed. Bad weather and German antiaircraft fire spread the drops over a much larger area, three to four times that intended. There was an early drop of a pathfinder teams who were to mark the landing zones, but they were largely ineffective. The Rebecca/Eureka radar transponder system was intended to guide the C-47s to the drop zones, but it did not work properly. The town was taken about 0500 on the 6th by the 505th Parachute Infantry Regiment (profiled in Band of Brothers), one of the few units to have been dropped accurately onto their objective. There were heavy German counterattacks from later on the 6th until U.S. armored forces arrived during the afternoon of the 7th. The town is old, it was founded in the 12th century. It has never been very large. Today's population is around 1,600. This is the old church in the open square at the center of town. The town square is now known as Place du 6 Juin 1944. Notice the parachute hanging from the nearest corner of the central tower — paratrooper John Steele of the 505th Parachute Infantry Regiment caught the tower with his parachute and was left hanging from the tower during the battle. He avoided capture by the Germans by hanging motionless and pretending to be dead until the town was taken by the American paratroopers early in the morning. We got the idea from talking to some locals that the people living in the area at the time just wanted to put the war behind them and get on with their lives. 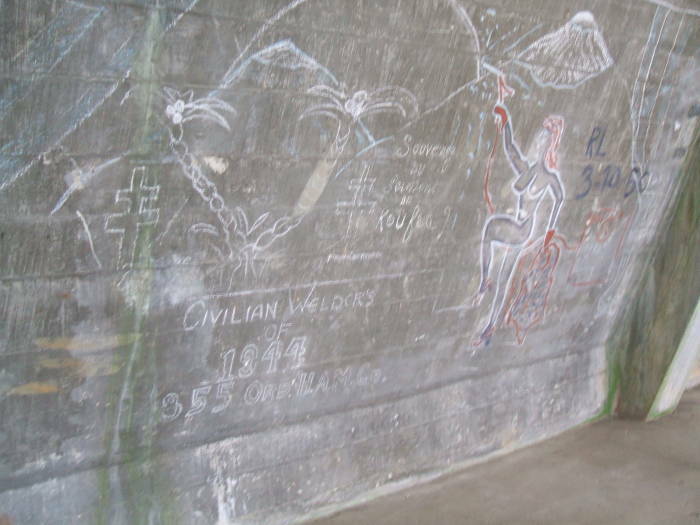 It was only in the late 1980s and 1990s that local interest in the history of the war years increased among the younger generations. This replica of John Steele was placed on the tower at the 50th anniversary observance in 1994. The stained glass windows in the church now feature recent events. This one shows two paratroopers, with more parachutes visible in the background and the church itself at lower right. 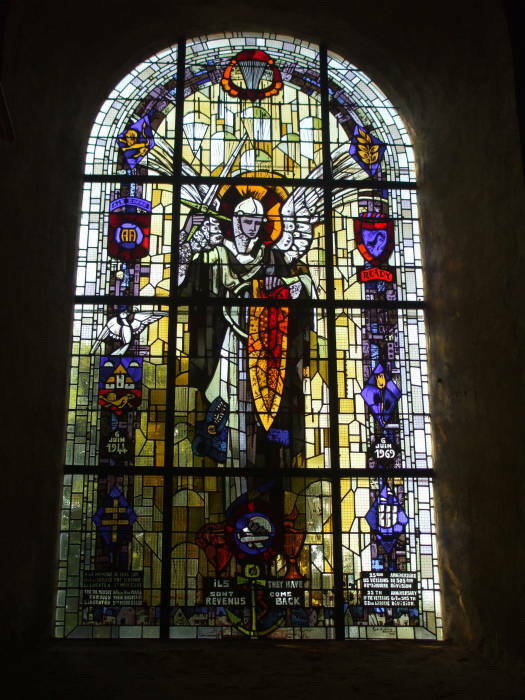 Another window in the church features the insignias of Allied units involved in the invasion. 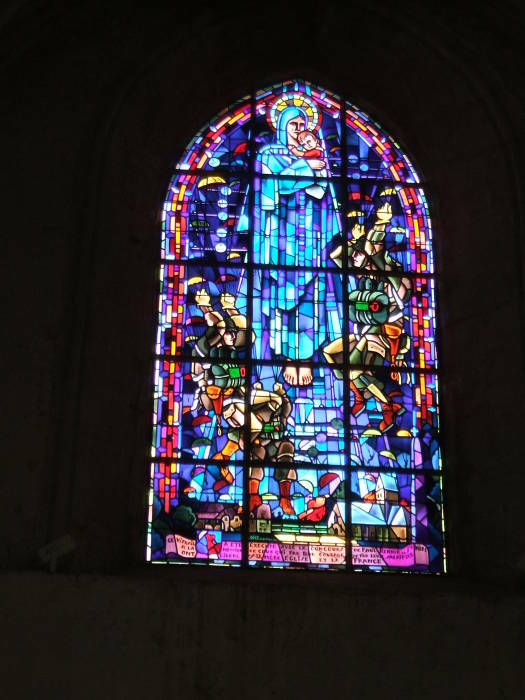 One of the paratrooper stained glass windows. Ils sont revenus. They have come back. The Normans invaded north across the channel in 1066. Now they have returned to drive out the Axis. Tourism is now the main business in town. Visits during June would take a lot of advance planning, and reservations well in advance. We were there in mid-September, when things were quiet but the weather was nice and things were open. We had our choice of places to stay. Were we close to things? 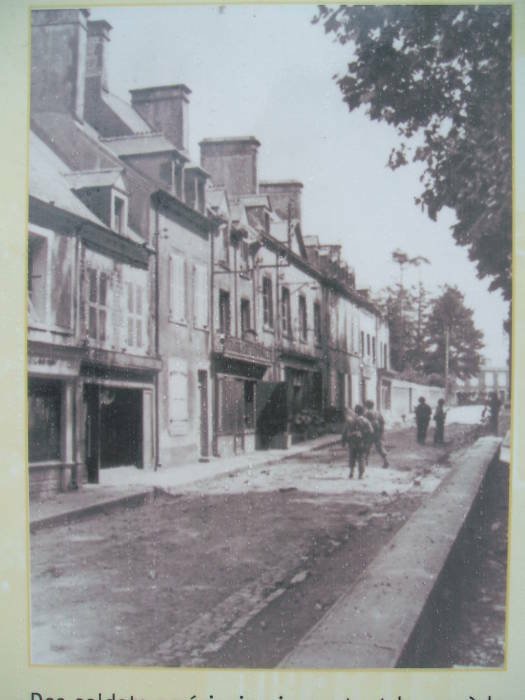 We were right on Place du 6 Juin 1944, and just across the street from the church. The only drawback was that we were very aware of every time the church bells rang the hours. 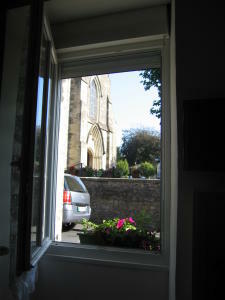 The view out our kitchen window. Yes, that's the main door of the church right across the narrow street. A number of placards around town show pictures taken during June, 1944. The placards are placed where the pictures were taken, so you can compare the view then and now. These paired pictures look east along the north side of the main square. 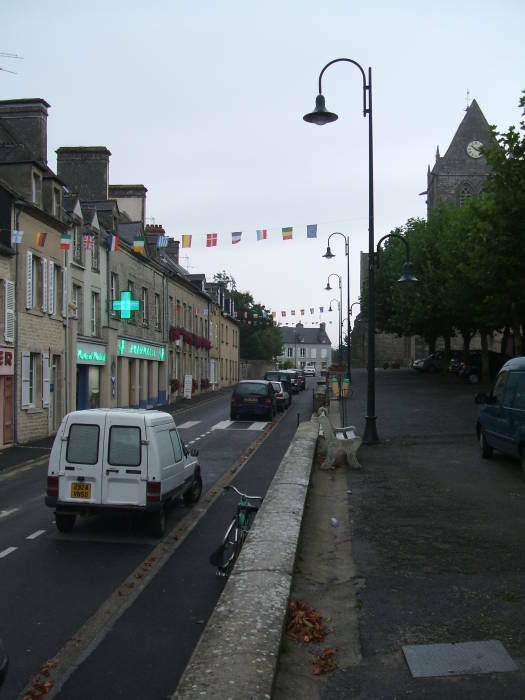 The church is visible at right in today's view, and the place we stayed is the building with the red flowers in window boxes, just beyond the green neon sign of the pharmacie. The bedrooms on the upper levels put us pretty close to those bells. The north side of the square in 1944. The north side of the square today. It's quiet at night in Sainte-Mère-Église. There's a small place where you can get pizza, a couple of bar-tabac places open later, and that's it in the evening. The bar-tabacs are also good places to make like a local and get pastry and coffee in the morning. There's a great museum just a couple of blocks off the main square. It has a DC-3, a glider, a couple of armored vehicles, and lots of uniforms, equipment, maps, and documents. 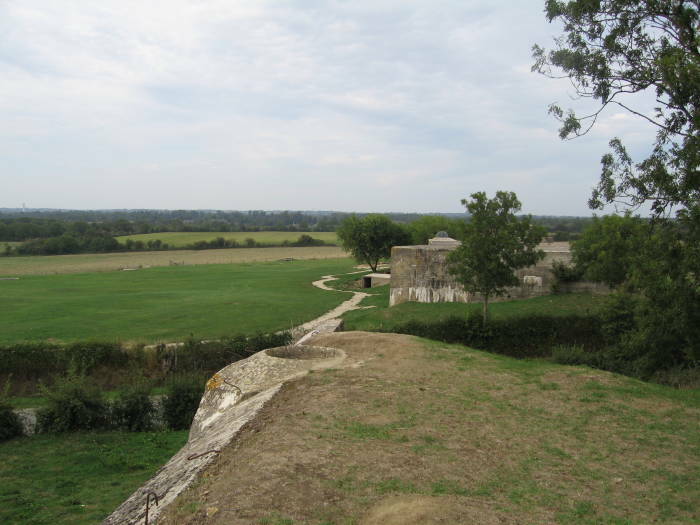 Écausseville had a French military airfield from the early 1900s, with a unusual large concrete (!) hanger built in 1915. Yes, this tall structure with thin curving walls is made out of concrete. 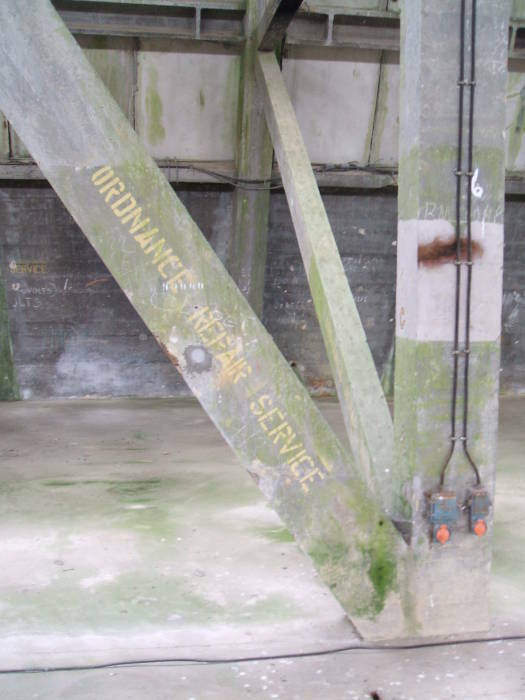 The hanger was for captive balloons used to defend Cherbourg. 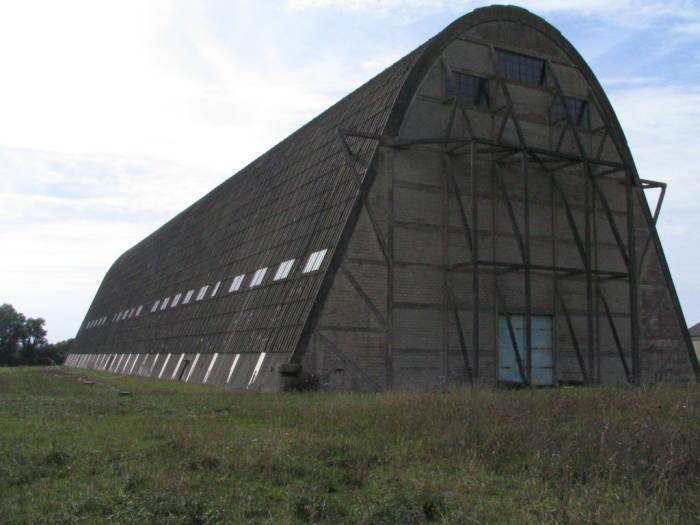 A wooden dirigible hanger was built parallel to it, but only traces of it remain. Concrete lasts. 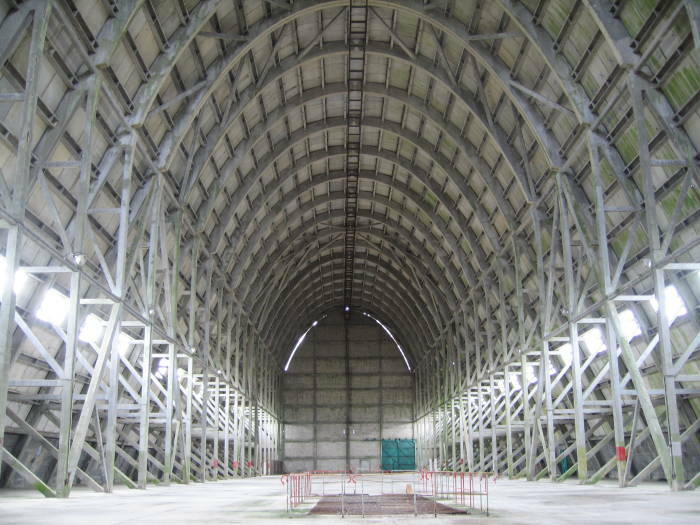 The hanger is big — 150 meters long and 32 meters tall. 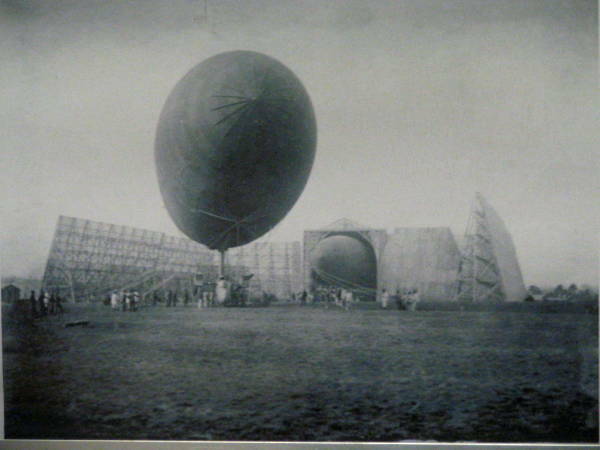 An old photograph showing balloons. Écausseville hanger — 150 m long and 32 m tall. This end is braced, the opposite end opened. It was open when we visited. Well, more or less open. We were looking around outside when a guy came out and invited us in. They weren't officially open but they had hard hats laid out for visitors. 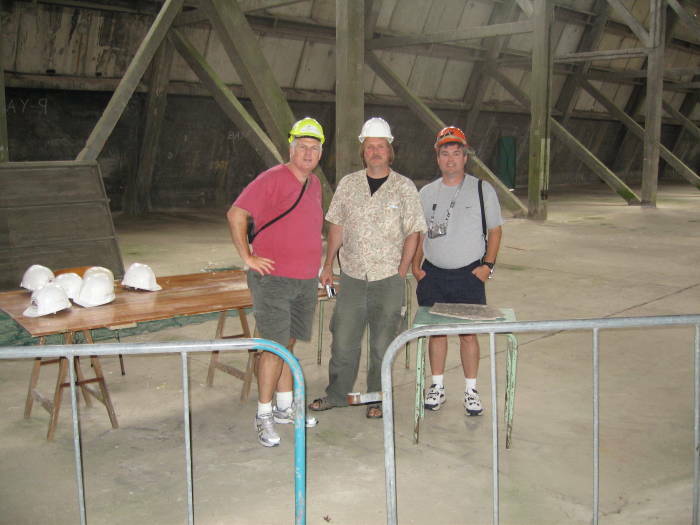 Time for some hard hat tourism! Looking toward the hanger doors. 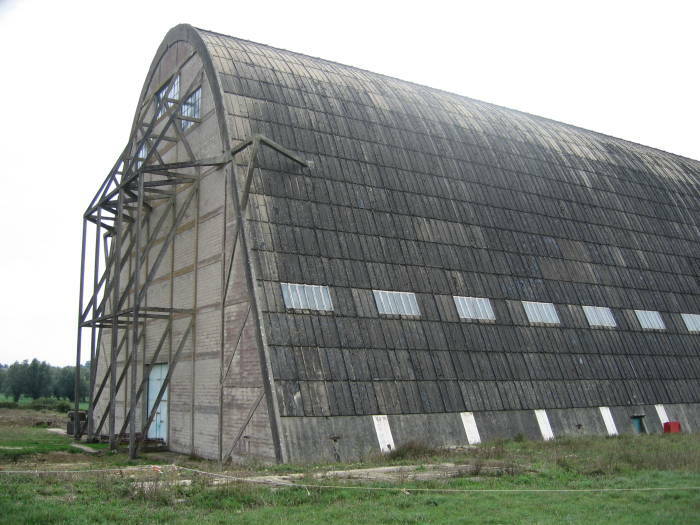 The Germans had occupied the area in 1940 and taken over the hanger, using it for the same purpose. They also stored 150 mm mobile guns here. 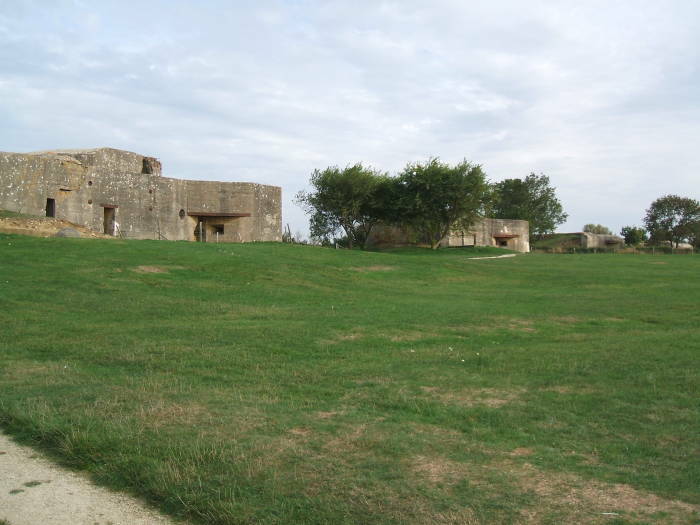 88 mm guns and machine gun nests defended the site. 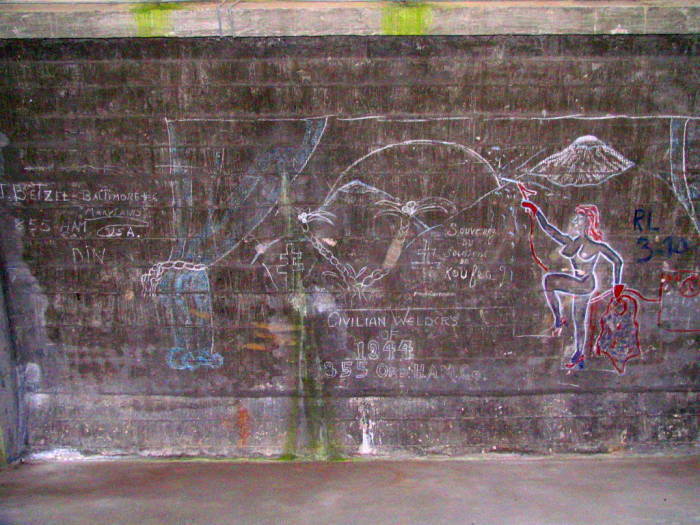 The hanger was finally taken by American airborne troops a few days after D-Day, with heavy casualties. Bay #2, between the side braces. It was then used as a supply and servicing depot by the Americans. A few labels and more graffiti remains from that era. Here you see that Ordnance Repair Service was set up in one of the narrow spaces between the braces. 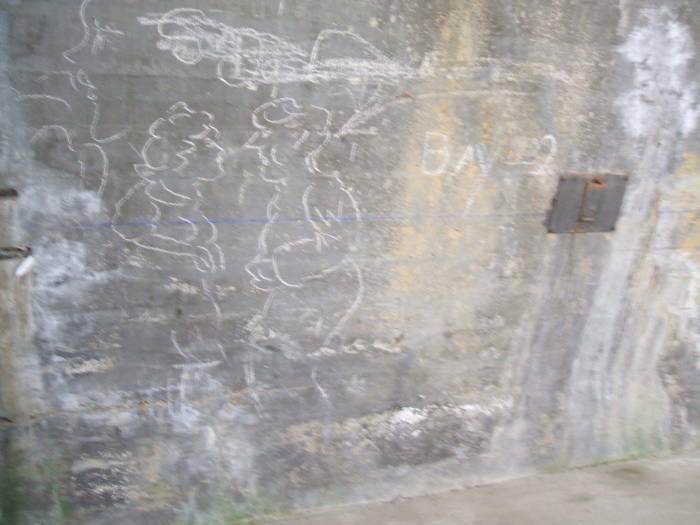 "Bay #2" was the official marking of this work area, with unofficial decoration. Some of the graffiti got rather involved. The hanger reverted to the French military after the war, but there was no longer much use for large concrete hangers for captive balloons. Some local people formed a historic association and worked in their spare time to restore the site. The hanger was open for visits if you happened to visit the place, as we did. They seem to have raised the money a couple of years after our visit to open it as a more organized museum. Azeville Battery is just east of the village of Azeville on the D269 road. 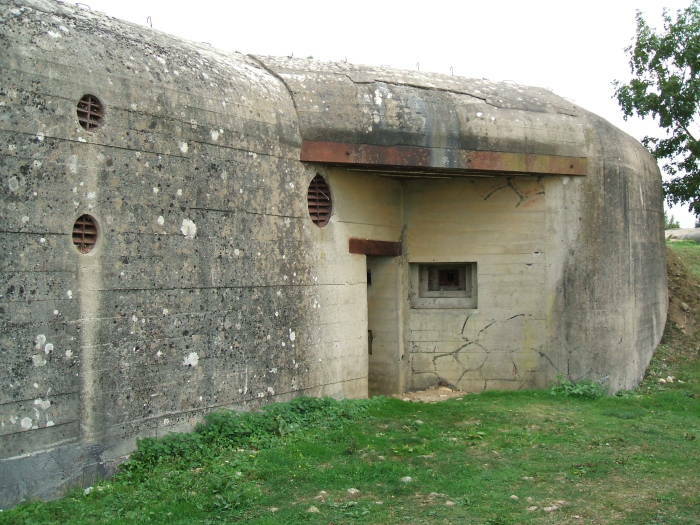 It was the first of the Atlantic Wall sites to be built by the Germans on the Cotentin Peninsula. 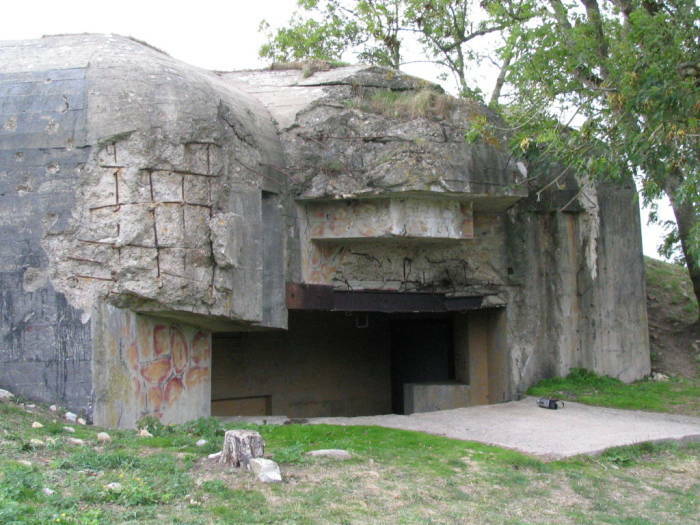 The exposed reinforced concrete was painted to resemble the stonework of the local houses, and much of the site was camouflaged with a layer of soil that also added a little protection from incoming shells. 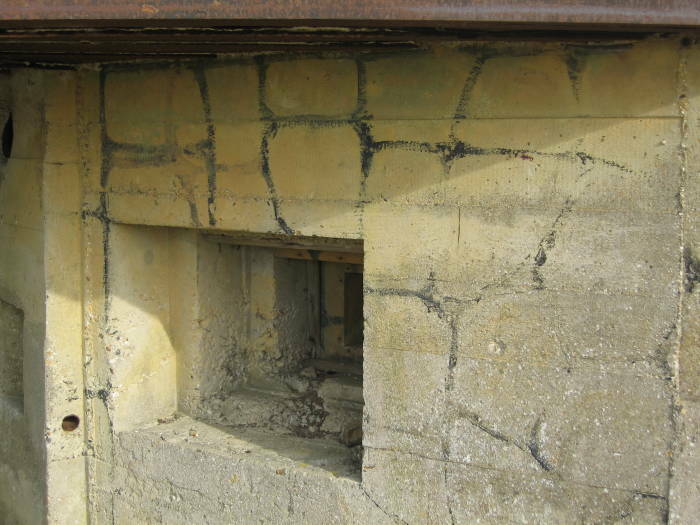 Although, as you see in our pictures, these gun casemates took quite a bit of damage from American artillery. The main guns in the four primary casemates were 105 mm naval guns with a 11 kilometer range, and they were manned by Kriegsmarine personnel. They were captured French guns — they had first seen service on French ships in WWI, the ships had been captured by the Germans, and in 1942 the guns were brought here and installed in the newly constructed battery. 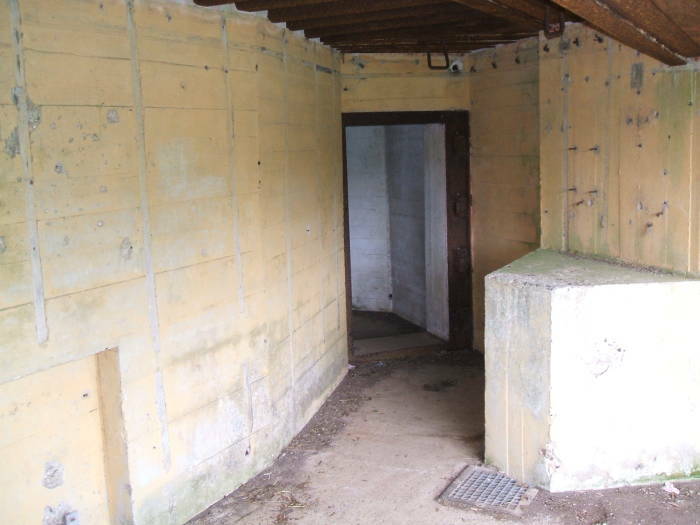 This battery was a "blind" one — you could not see the targets at sea from the gun locations. Radio signals from spotters near the beach could be used, or reports over telephone lines from a spotting point at Crisbecq, just a little closer to the beach but with a good view of the beach and its approaches. 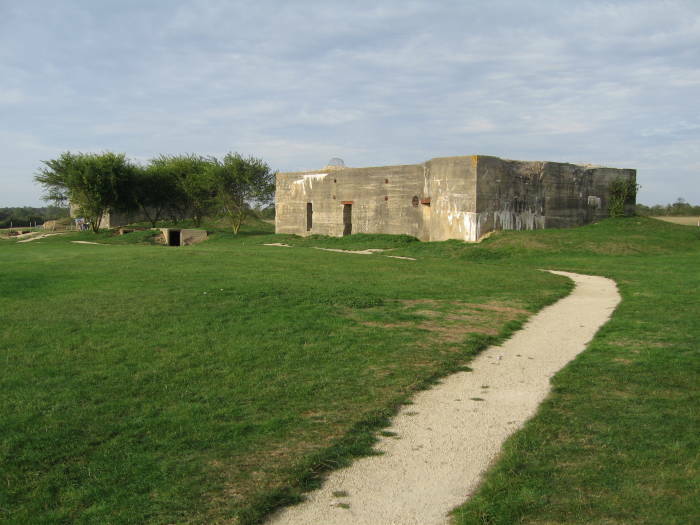 The battery was protected by two 37 mm anti-aircraft guns, a number of machine gun nests, and mine fields. You can see the surrounding farmland in this picture. We were given a tour through the bunkers and tunnels by a girl who had recently graduated from l'Universite Sorbonne with a history degree. She and her peers were more interested in the history than their parents and grandparents were. 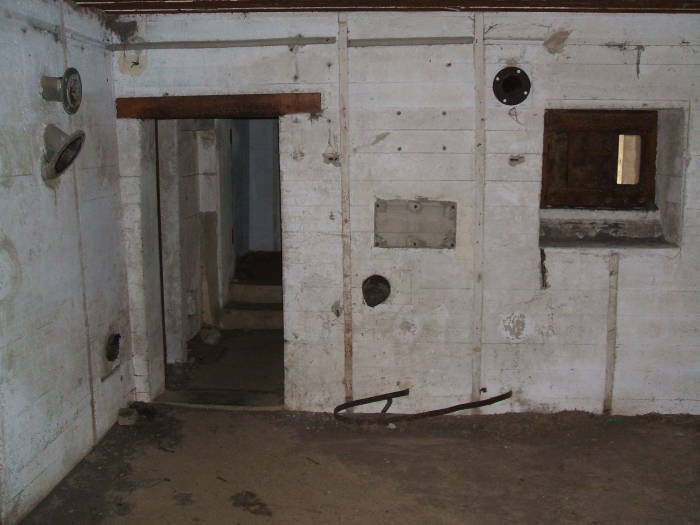 This battery had just been cleaned up and opened for visitors a few years ago. Until then, it was just a ruin in the farm land. The local farmers didn't use the land within the site, because batteries were also protected by minefields. If you knew about it, and brought your own lights, and didn't mind climbing over the rubble (and weren't worried about mines), you could visit it. Now they have cleaned the site up and opened it for visits. 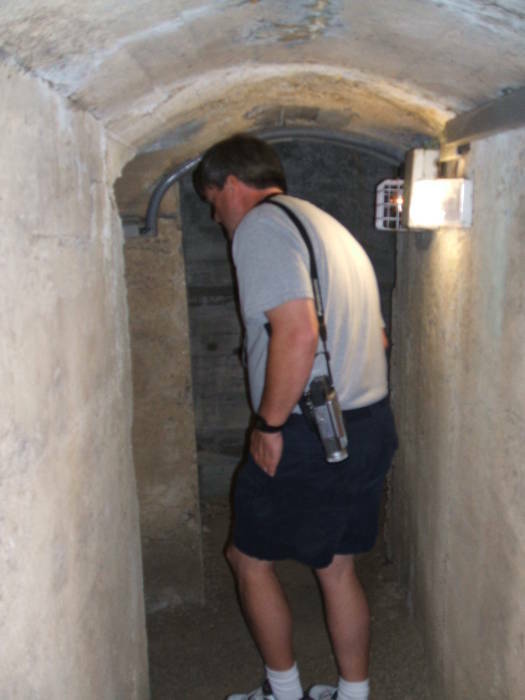 You can go through the battery, including some of the remaining 250 meters of tunnel joining the various casements (and passing under the D269 road). You see the heavy damage caused once the American guns found the range. 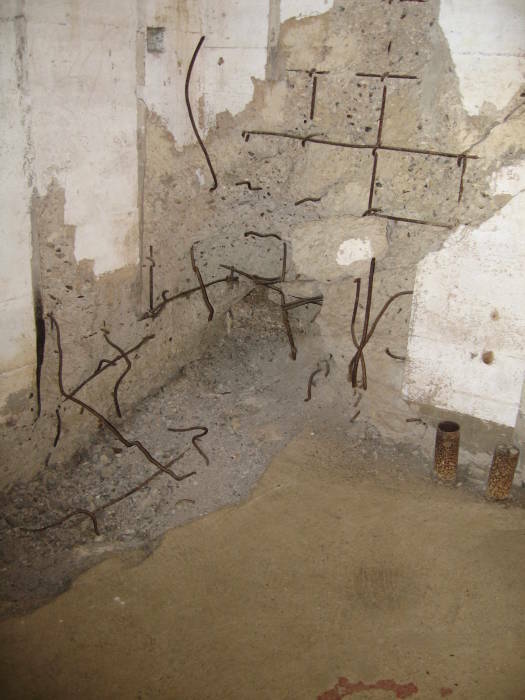 Although the walls are of reinforced concrete and several feet in places, a strike outside could cause deadly spalling of the inner surface. All this is just the first day or two in Sainte-Mère-Église. We stayed there for several nights and visited many more sites, so go to the next page to see pictures of Brécourt Manor, Sainte Marie du Mont, Angoville au Plain, Carentan, and Mont Saint-Michel.